A 12" interview picture disc. Colur photo of Lemmy on front with bandname in white and at the bottom the cat no MM 1213. A colour photo of Wurzel on the back. On the back it also has the band name in white. I have seen copies housed in die cut Tell Tales Interview picture disc record company sleeves. 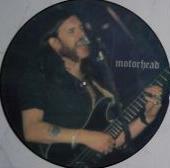 Limited Edition, Interview picture disc, MM 1213, (P) (C) 1986, Made in England.